If you’re child was born with any kind of eye issue, more likely than not, they are required to wear eyeglasses. The trick to caring for your eyeglasses is making their care become habitual. When properly caring for your glasses becomes routine, it becomes less of a chore and more of a way of life. 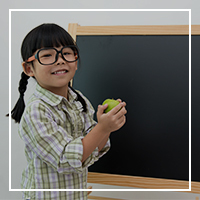 By teaching your child proper eye care skills now, they will be more likely to use those lessons in the future. The main difficulty when trying to teach a child proper eyecare is that they are still youthful, and perhaps being a little too rough on their glasses. The important thing to keep in mind is that accidents happen, so it is best to not be too upset if your child’s glasses get scratched or broken. It is best, especially when your kids are younger, to have them wear protective vision goggles. The goggles are extra durable and scratch resistant. However, when children get older, the less likely they will want to wear their goggles. The following is a list of tips and tricks to teach your children, in order to keep their glasses safe from damage. When teaching your child to clean their glasses it is important that you use the right solution and materials. For instance, you always want to clean their glasses with warm water. You can use dish deterrent as a form of soap for the lenses, but only a drop. If you use too much soap, a build up of residue can form, making it difficult to see out of the lenses. When cleaning with the water and soap you never want to use a paper towel, hand towel, or tissue. Though these surfaces may seem soft to the touch, the material can be quite rough. In the case of the hand towel, pieces of dirt, dust, and tiny particles can be attached to the fabric. When you wipe the lenses of the glasses with the fabric, you are essentially smearing the rough material on the glasses. This, of course, leads to scratches. When cleaning your child’s lenses, do not use bleach, vinegar, or window cleaner. Though these solutions are successful in cleaning other materials and surfaces, when they come in contact with the lenses of eyeglasses the effects can be disastrous. This malpractice can lead to the wear down of the lenses and their protective coatings; these coatings can range from anti-glare coating to sunlight protection to anti-scratch coatings — all of which are expensive to add into the lenses upon purchase. Also, never spit on your glasses to clean the lenses. Your saliva is actually riddled with bacteria and oils that work to dissolve the surface of your glasses. If you are not close to a water source when your glasses get dirty, you should always have lense towelettes on-hand. The wipes will help you keep your lenses clean without compromising the integrity of your lenses. Protecting your child’s eyeglasses is essential to their upkeep. When glasses are neglected on counter tops, in cars, and in bags, they are more likely to become broken or scratched. Purchasing a durable case to protect your glasses will be one of the best purchases you are likely to make. Why? Glasses are expensive! Not only are frames costly for repair or replacement, but getting new lenses can cost up to hundreds of dollars! When getting a pair of glasses you should buy a hard-shell case, simultaneously. A hard-shell case is made with a tough outer material so it will protect your glasses when they are put in your glove compartment or in a bag. When you rely on other cases for your glasses, they are less likely to protect your glasses from being crushed under the weight of your things. For example, if your child stashes their glasses in their backpack, a soft-case will allow their glasses to be crushed under textbooks and notebooks. On the off-chance you don’t want to buy a hard-shell case, a soft-case is better than no case at all. Make sure that you teach your child about the proper way to store their glasses. Simply throwing them, unprotected, with no case, will almost guarantee that they will become damaged. If you follow these steps and work to instill these lessons with your child, you can ensure their glasses will last longer. By teaching proper cleaning and care methods, your child will learn and incorporate these teachings into their daily lives, saving you time and money. If your child has been complaining of eyesight-related issues or currently struggles with their eyes, perhaps you may need to seek other methods to help them. 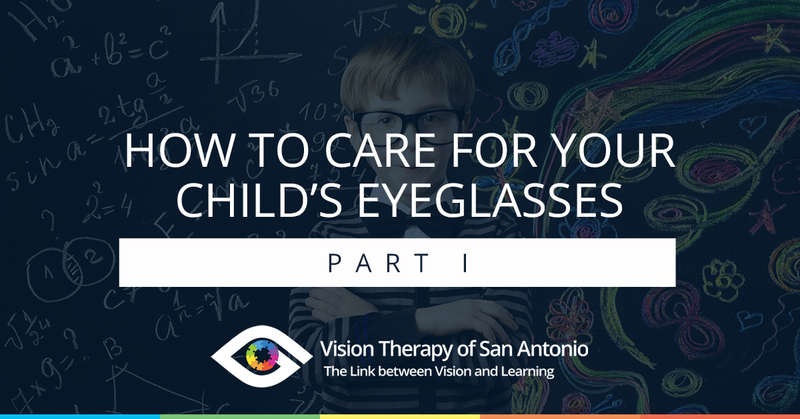 At Vision Therapy of San Antonio, we serve to help your child with eye therapy exercises to strengthen their sight. If you think your child could benefit from eye therapy, call Vision Therapy of San Antonio today!